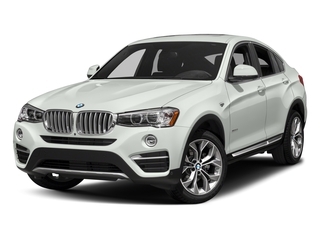 The BMW X4 comes in two basic guises: X4 xDrive28i and X4 M40i. The xDrive28i is powered by a turbocharged 2.0L 4-cylinder engine that produces 240 horsepower, while the M40i utilizes a twin-turbocharged 3.0L 6-cylinder engine producing 355 horsepower. In both cases, power is sent to all four wheels via an 8-speed automatic transmission. The X4 further sets itself apart from the X3 with a unique interior featuring very nice materials and high quality construction throughout. The ride height is lower than in the X3 and it offers drivers a more classically coupe-like view throughout the greenhouse. Handling has been improved over the X3 as well, with the X4 doing some serious sports car-like performance on winding roads, thanks to a lower ride height and aggressively tuned suspension. The X4 comes nicely equipped with both xDrive28i and M40i versions getting a very similar set of amenities. Standard equipment includes 19-inch wheels, power adjustable front seats, a powered glass moonroof, advanced vehicle and key memory, a powered tailgate, rear parking sensors, rain sensing wipers, dynamic cruise control and a 9-speaker stereo with satellite radio with an optional Harman/Kardon surround system. The "M Sport" package is now available on both xDrive28i and M40i models. This package significantly changes the exterior of the X4, with the M Sport line deleting various chrome bits and adding more aggressive, body colored exterior enhancements. The M Sport line also includes unique 19-inch or 20-inch wheels, Dynamic Damper Control, an "M" steering wheel, metallic exterior paint, and a few interior styling tweaks. The 2018 BMW X4 has received a number of stylish exterior updates for model year 2018. The front end is inspired by the X3's design, and features slimmer headlights, a more upright nose, a front bumper dominated by larger air inlets and aggressive down-sloping roof line. 19-inch wheels are now standard while out back the updated taillights look aggressive wrapping around the sides of the vehicle. The "M Sport" package is now available for both the M40i and xDrive 28i models. As is BMW naming convention would suggest, the X4 slots between the X3 and X5 in terms of base price. Functionally, it is similar to the less expensive X3, however like the X6, the X4 offers a sensuous, sloping roofline giving the X4 a unique and attractive look. The end result is a vehicle that offers both sporty styling and SUV-like practicality and ground clearance.